It is not a coincidence that our fth jubilee conference will take place about 15 km from where T2M was founded in November 2003. The executive committee decided three years ago to return to where T2M’s cradle stood and, at the fth event, look the edgling hybrid in the face and ask ourselves where it now stands, and where it should go. Quite a lot of labour has been done since then. I am not going to repeat my earlier short lists of accomplishments (and failures) here, but it can be boiled down to an assessment that the T2M initiative responded to a latent need among transport, mobility and tourism historians to have a platform for intellectual exchange and encounter. For the fth time now, we have a large number of abstract submissions (more than 90) and if you look at T2M’s website, you will nd a lot of arguments why, this time, you should bring your partner as well. 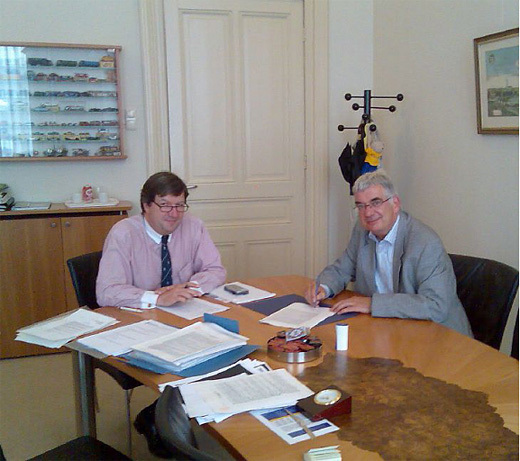 On Wednesday, 20 June 2007 (for later historians: at 5.43 pm sharp), president Gijs Mom signs the T2M statutes in the ofce of notary Mr. Peter Blokland in Tilburg, The Netherlands, on behalf of all Executive Committee members in absentiae mentioned in the ofcial document. Mr. Blokland is a collector of miniature car models (for the connoisseurs, ‘H0’ models). Here in the Netherlands, we are very busy. With the help of several EC committees, we have been organising the conference program, the excursions on Friday, the Mobility Heritage Event on Thursday, the Design Event and the banquet on Saturday, and a special wrap-up nal plenary session on Sunday. The latter, following special requests from several PhD members, will follow the excellent example set in Paris by Vanessa Schwarz and Vincent Kaufmann, who acted as guides for us all regarding the ‘lessons to be learnt’ from the previous conference sessions. This year, the design historian Penny Sparke will do the wrap-up, and we are still looking for a colleague-expert on heritage. More good news: We just heard that we got the funding (84,000 Euros from the Eindhoven regional authorities!) for the Design Event, which means that you will be able to witness the results of one year of hard work by dozens of students from the design schools of the three Dutch technical universities and of the Design Academy in Eindhoven on car interiors, while you also will be able to attend the special plenary session on Saturday dedicated to the History of Mobility, Interior Design and Gendering where train and ship interiors will be dealt with equally. During this session we will experiment with one of the main issues of our policy, namely to bring historians and non-historians (in this case: designers and engineers) together in order to investigate the relations between history and current- day issues, and nd ways to revise our theoretical concepts as well as expand our eld. The Heritage Event on Thursday afternoon, just before the ofcial opening of the conference, will be dedicated to the launch of the Dutch Virtual Mobility Museum (VMM) developed by the ECMD in cooperation with the mobile heritage community in the Netherlands, funded by the three large Dutch cultural funds and supported by the Ministry of Culture and Education. We will benet from your presence in the Netherlands, especially those of you afliated to museums and heritage in general, to discuss the possibilities of ‘going Europe’ as a rst step towards a global VMM. We hope that this event will result in the founding of a consortium of interested international parties who are willing to cooperate in building such an international virtual museum. As the future VMM will also contain a Study Room, a Forum and other parts where transport and mobility historians could contribute, you are cordially invited to take part in the discussions (please let us know whether you intend to attend, so we can choose a proper meeting room and make sure that you have some tea and coffee). to come (and take some rest afterwards…).